If we talk about the artist, whose central theme has always been flowers, then this, of course, Claude Monet. 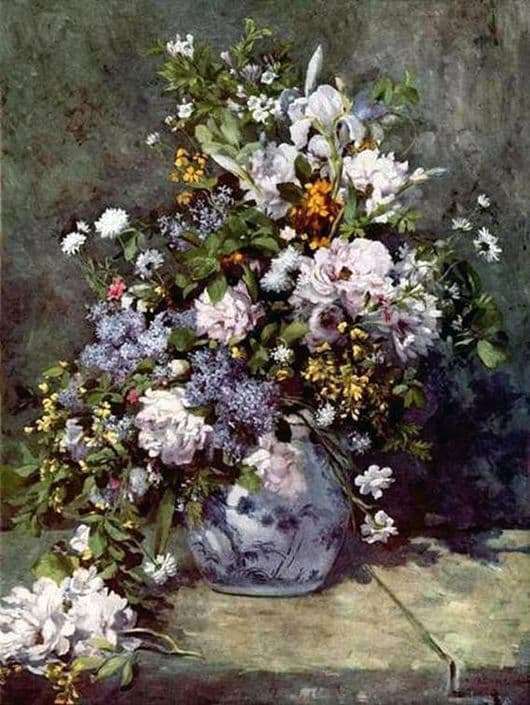 His friend, Pierre Auguste Renoir, loved to paint genre scenes and portraits, but flowers in wreaths or bouquets became for him just rest and entertainment. Nevertheless, the artist created a lot of paintings dedicated to flowers, so it’s hard to establish exactly whether the picture we are looking at was originally called “Vase with Flowers”, and not, say, “Flowers in a Vase”. It all depends on the accuracy of the translation of the name of the canvas. Nevertheless, all these pictures are beautiful and worthy of description. Flower still life at all times was considered a classic. Such paintings were easily sold, so Pierre-Auguste could write them even for the purpose of earning a living. But if the artist is a genius, then a true masterpiece always comes out from under his brush. So this time. Beautiful flowers contrast with the rough board of the table, on which stands a vase. It seems that it reflects everything in itself, as in a crooked mirror, but if you look closely, you realize that it has its own drawing. The bouquet also contains various garden flowers: lilac, peonies, daisies, watersheds and many other plants. That is why this impression of the bloom of a blooming garden is created. A sprig of peony even fell on the table, looking up from the main stem. The theme of nature continues and the background for the bouquet. It is so similar to the greens growing on a hillside, but the shadow of the bouquet leaves no doubt that behind it is just a flat wall painted in the colors of forest moss and earth. Shadow balances the composition, making it harmonious. Most of these still lifes of Renoir settled in private collections, but he wrote a great many such paintings, and they are all beautiful. on which stands a vase. It seems that it reflects everything in itself, as in a crooked mirror, but if you look closely, you realize that it has its own drawing. The bouquet also contains various garden flowers: lilac, peonies, daisies, watersheds and many other plants. That is why this impression of the bloom of a blooming garden is created. A sprig of peony even fell on the table, looking up from the main stem. The theme of nature continues and the background for the bouquet. It is so similar to the greens growing on a hillside, but the shadow of the bouquet leaves no doubt that behind it is just a flat wall painted in the colors of forest moss and earth. Shadow balances the composition, making it harmonious. Most of these still lifes of Renoir settled in private collections, but he wrote a great many such paintings, and they are all beautiful. but if you look closely, you realize that it has its own picture. The bouquet also contains various garden flowers: lilac, peonies, daisies, watersheds and many other plants. That is why this impression of the bloom of a blooming garden is created. A sprig of peony even fell on the table, looking up from the main stem. The theme of nature continues and the background for the bouquet. It is so similar to the greens growing on a hillside, but the shadow of the bouquet leaves no doubt that behind it is just a flat wall painted in the colors of forest moss and earth. Shadow balances the composition, making it harmonious. Most of these still lifes of Renoir settled in private collections, but he wrote a great many such paintings, and they are all beautiful. but if you look closely, you realize that it has its own picture. The bouquet also contains various garden flowers: lilac, peonies, daisies, watersheds and many other plants. That is why this impression of the bloom of a blooming garden is created. A sprig of peony even fell on the table, looking up from the main stem. The theme of nature continues and the background for the bouquet. It is so similar to the greens growing on a hillside, but the shadow of the bouquet leaves no doubt that behind it is just a flat wall painted in the colors of forest moss and earth. Shadow balances the composition, making it harmonious. Most of these still lifes of Renoir settled in private collections, but he wrote a great many such paintings, and they are all beautiful. catchments and many other plants. That is why this impression of the bloom of a blooming garden is created. A sprig of peony even fell on the table, looking up from the main stem. The theme of nature continues and the background for the bouquet. It is so similar to the greens growing on a hillside, but the shadow of the bouquet leaves no doubt that behind it is just a flat wall painted in the colors of forest moss and earth. Shadow balances the composition, making it harmonious. Most of these still lifes of Renoir settled in private collections, but he wrote a great many such paintings, and they are all beautiful. catchments and many other plants. That is why this impression of the bloom of a blooming garden is created. A sprig of peony even fell on the table, looking up from the main stem. The theme of nature continues and the background for the bouquet. It is so similar to the greens growing on a hillside, but the shadow of the bouquet leaves no doubt that behind it is just a flat wall painted in the colors of forest moss and earth. Shadow balances the composition, making it harmonious. Most of these still lifes of Renoir settled in private collections, but he wrote a great many such paintings, and they are all beautiful. However, the shadow of the bouquet leaves no doubt that behind it is just a flat wall, painted in the colors of forest moss and earth. Shadow balances the composition, making it harmonious. Most of these still lifes of Renoir settled in private collections, but he wrote a great many such paintings, and they are all beautiful. However, the shadow of the bouquet leaves no doubt that behind it is just a flat wall, painted in the colors of forest moss and earth. Shadow balances the composition, making it harmonious. Most of these still lifes of Renoir settled in private collections, but he wrote a great many such paintings, and they are all beautiful.